Democracy at it's finest I would say. The project My Football Club has the goal to raise enough money to buy a real world football club in the United Kingdom. Every member pays an annual fee of £35 which in turn gives the member an equal share in the football club. All important management decisions such as buying and scouting new players and team selection are democratically decided by counting all member votes with each member having exactly one vote. The project has more than 53000 members already who are currently deciding on the club that they would like to buy. The most popular club will be bought if it meets the requirements which are: 51% or more of the football club shares can be bought, it has no or a manageable debt, potential to reach the Premiership and the size of the stadium and public transport situation. The idea is intriguing and it really could work. A social experiment so to speak of. I especially like the idea that the members decide where the money will be spend. All profits will be reinvested and it will be nice to see how that money is spend. Owners not only decide about new players but also on Youth Policy, Stadium and Infrastructure. I also think that the whole project looks a bit like scam as well. While it surely is not with all the media coverage it got it remains hidden from the members who the initiators of the project are. Update: It seems that a club Ebbsfleet United has been found and that it is now under control of My Football Club. You can read more about that on the official page. 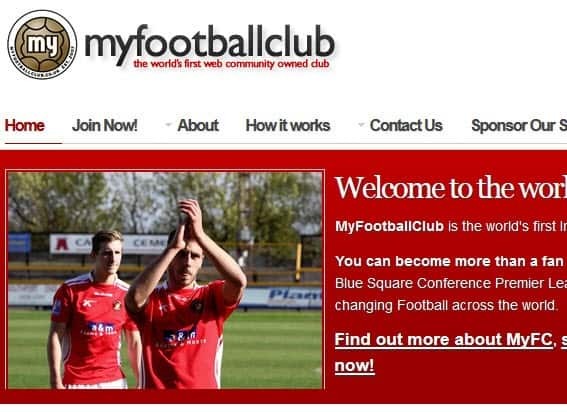 I’m a member of MyFC (My Football Club) and I’d just like to clarify a few things. First off, we know who started the project (Will Brooks and his staff) because we’re able to talk with him and other members of his team on the forum in the members’ area. You can search for Will and MyFootballclub.uk on YouTube to see him talking about the project. Also, we’ve put our money down, but our membership doesn’t start until the first day of the club purchase. If MyFC doesn’t purchase a club within one year, we’ll get our money back and any interest earned off the money will go to a UK football charity. Thus, there’s no risk to “invest” right now. In fact, we all believe we’ll get a big rush of new members once a club is purchased. As for special privilege for being the first members, that’s been debated, but we’ve decided that there should be no distinction between members in any way shape or form, especially if you just signed up 10 years into the project or were one of the first 10 to sign up and pay. No special treatment. AS I said before, we’re not really risking anything and will get our money back if it doesn’t come through. If you have any questions, contact me and I can help or get you to someone who can. I am highly interested in investing! it would be an honor to be part of this magnificent project! please let me know what I must do. top 10 football club owner which has money.